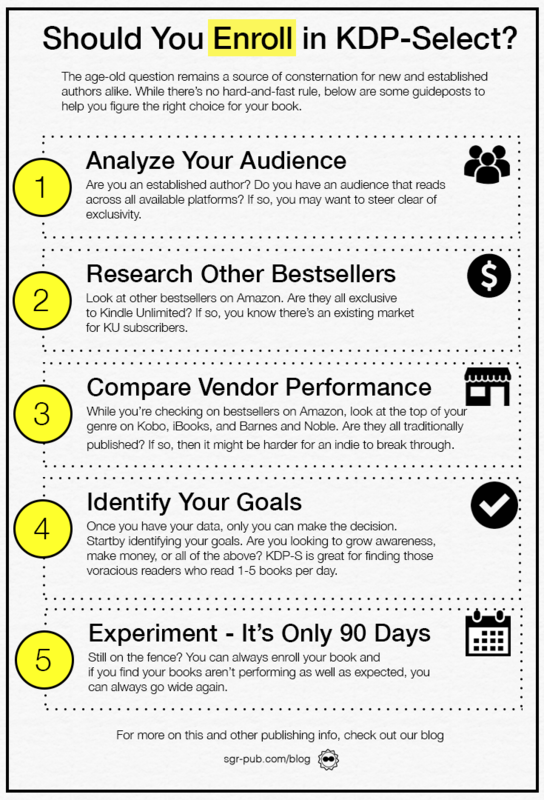 If you’re going to self-publish, familiarizing yourself with Kindle Direct Publishing (KDP) is probably pretty high on your priority list (right behind getting the manuscript written and edited). When you first arrive, Amazon tells you that your book will be in front of millions of people. The truth is, it will be, but along with the millions of other books Amazon has in its catalogue. So how do you get yours to stand out? Let’s talk a little bit about what KDP does for you, what they don’t, and how you can maximize your book’s visibility. Publishing your book on Kindle Direct Publishing will make it available for sale within 12-24 hours. In a few select cases, such as when the print version is available before the Kindle version, that timeline might take a bit longer. KDP will also display your author name (you have the option to make changes to this page via Author Central, which we’ll talk about in an follow-on post), the description of the book, the information such as ASIN (Amazon’s unique identifier, different from an ISBN) and more. Amazon will also allow users to add reviews of your book–whether or not they’ve read it. Amazon will not edit nor format your book (although you can hire them as part of a separate service). Amazon will not promote your book, unless you meet a specific set of criteria within their search algorithms (the automated process that determine what meets your search and what doesn’t). You’re also on your own for cover design, pricing, description, keywords, etc. Basically, KDP is a platform, not a service. Relying solely on Amazon to promote your book is not recommended. Although Amazon owns 80% of the eBook Market, owning so much of a market means small changes have big impacts to large sections of the market. A simple tweak to their search calculations could move thousands of books from the front pages of search results. As with most things in life, it’s better to have a varied approach to your advertising to absorb the shock from changes in the marketplace. Within Amazon, the number one way to maximize your visibility is to utilize the keyword field. This field is how your books are categorized outside of the BISAC (Book Industry Standards and Communications, the official, standard genre descriptions) and into Amazon’s unique lists, such as Coming of Age or Norse Mythology. Use keywords in your book description as well, especially if the genre is saturated.